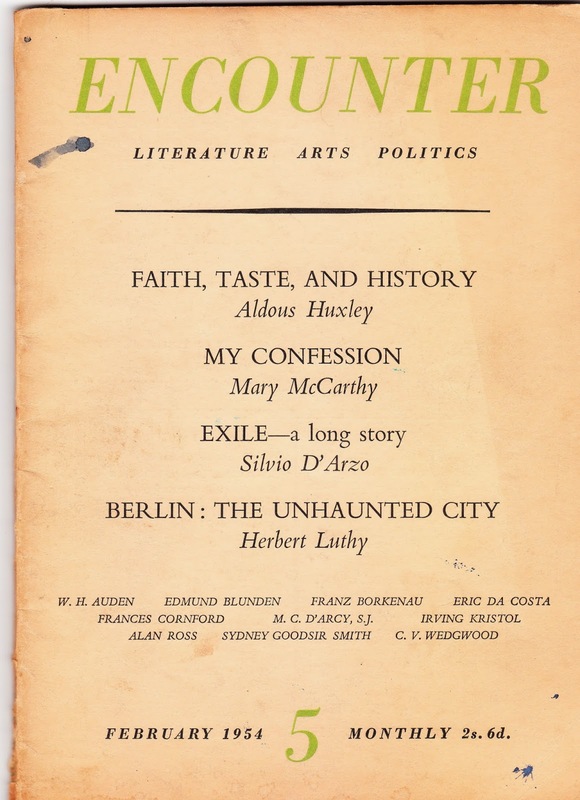 I cannot bring myself to part with all my back copies of Encounter, the magazine published from the mid 1950s by the Congress for Cultural Freedom, a group of left-leaning anti-Stalinists. In the mid-Sixties publication of the journal was revealed to be partly funded by British and American secret services. However, this had not prevented it publishing W.H. Auden, Aldous Huxley, Mary McCarthy, Arthur Koestler, Kenneth Tynan, Daniel Bell, Claud Cockburn, A.J. Ayer, Alberto Moravia, James Baldwin, Nirad Chauduri, Albert Camus, John Braine, Bertrand Russell....(all picked from the first 25 issues). Imagine a journal as rich and diverse as this today, then imagine it being backed by the CIA and MI5. However, should anyone reading this want a bunch of old Encounters (very far from complete), I am more than willing to pass them on gratis.